When I booked my business trip to New York a few months ago, I could not stop thinking about all the new restaurants that I wanted to check out. After all, the last time I was there was over 4 years ago and the food industry has changed so much since then! With some research and recommendations from friends, I came up with a short list of about 25 restaurants I wanted to try. Here are the ones I actually got to and stay tuned for the next blog when I talk about all the gorgeous properties I visited! Red Farm They have 2 locations: West Village and Upper West Side. This is a farm-to-table Chinese dim sum fusion restaurant…it’s a mouthful (so to speak). The cool thing about the restaurant is the farm-like atmosphere they have created inside with wooden tables and printed linen. It is a simple décor and the food certainly shines here. The cherry on top was that all the restrooms have Toto toilets! [caption id="" align="aligncenter" width="540"] Spicy Shrimp stuffed Jalapeno Poppers, Kowloon Filet Mignon Tart-soy glazed beef on a miso filled tart shell-Eat in one bite, Crispy Duck and Crab Dumplings[/caption] Gramercy Tavern Went to Gramercy Tavern for lunch. The restaurant has a clean and rustic feel reminiscent of restaurants in Napa Valley with potted flowers everywhere and colorful murals on the walls. Gramercy was opened 2 decades ago by legendary restaurateur, Danny Meyer and Chef Michael Anthony has created a delicious seasonal menu; although I ate off the menu- I had the cheeseburger on a wheat bun with aged cheddar cheese. The best thing is they make their own ketchup, mustard, and mayo! The burger did NOT disappoint and well worth the $18. Fantastic place for lunch!! Toro Toro is located in Chelsea on 10th Ave and is in the former Nabisco factory. It is a Spanish tapas restaurant with both traditional and modern elements and as I mentioned, it is in a former factory building so it has a very industrial, brick building look, similar to that of Bestia in Los Angeles. Fun place, but not my favorite. [caption id="attachment_6880" align="aligncenter" width="540"] Razor Clams, Bone Marrow with beef cheek toast, Hamburguesas with smoked tomato relish, aioli and pickled onion[/caption] The PlazaFood Hall The Plaza Food Hall opened in 2012 and is located underneath the Plaza Hotel. What a gem this place is! It is like an upscale European specialty food and shopping space where you can find everything from crepes, sushi, caviar, chocolatiers, and everything in between. Not only does it house some of the most delectable global foods, the architecture is quite stunning with marble floors and mosaic details. Definitely a place to check out when in NY! Have an Exquisite Day and we'll see you next Wednesday! Since the ballroom was booked the night before for an event and we did not have access until 2 a.m., our team loaded in at that time and continued to work through out the night with carpeting and draping the ballroom. 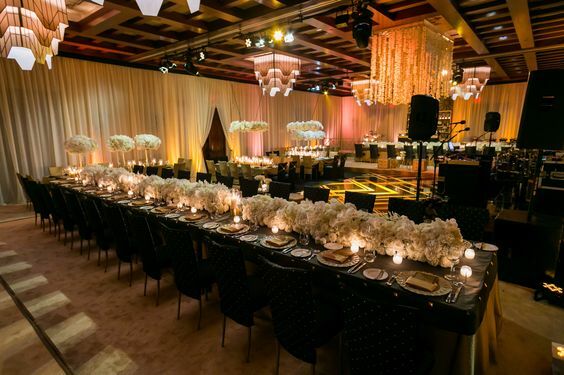 By 11 a.m. the next morning, the room started to take shape when the tables were rolled in and all the perspective team members brought their linens, furniture and flowers. The groom's family was already staying at the hotel and they paid several visits to check the progress. The groom was very relaxed and having a great time with his family and friends. According to Jordanian tradition, his friends gave him a hair cut and special lunch was brought in from an outside caterer to serve the guests. 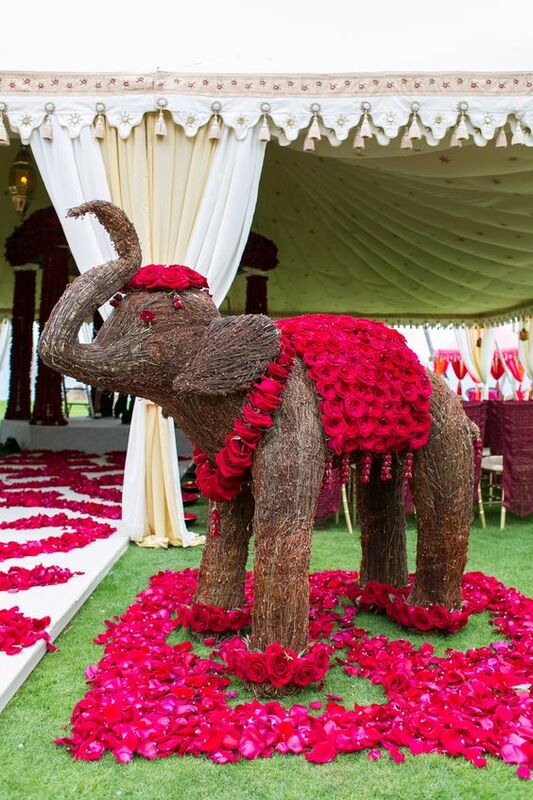 By the time the groom's family left to go to the bride's home to ask her hand for their son, the room had started to take shape and all the custom elements were evident. As soon as guests entered the ballroom, they were transported to another world; a world of unparalleled elegance, charm and beauty. There was a 19-piece band that played enchanting tunes and the lighting was magical. Each and every component of decor was painstakingly custom-created to achieve a cohesive look. The entire room was carpeted in silver gray with draping in double chiffon in two shades of gray with a custom white valance to give it a finished look. Two large trees painted in silver stood at the entrance with chandeliers hanging above them and a thick carpet of red rose petals below them. Multiple lanterns were spread all around. The cake table with custom linen in layers of tulle and silk was a show stopper. The 22k gold sword was a family heirloom that sat on the table with multiple candles and decadent flowers. The couple's sweetheart area was atop a riser and instead of a traditional sweet heart table they favored a love seat and a mirror-top table. The room was set with tables in all shapes and the two family tables were custom "chandelier" tables provided by revelry (notice the chandelier details in the tables). Stemware was chosen to perfectly fit the decor and ambiance. 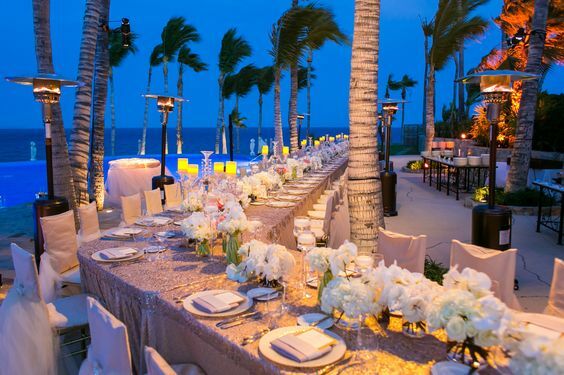 Three different table linens and chair covers were designed to compliment the room in the most stunning fashion. 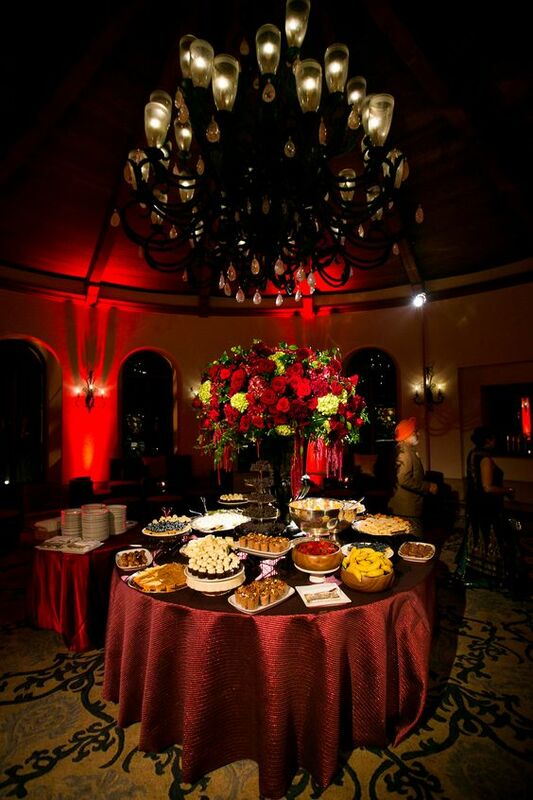 Since the room was entirely dressed in shades of gray and whites, a pop of color was provided with red flowers. This was a completely different look from the couple's ceremony which had muted shades of champagne, golds and ivories with hints of blush. [caption id="" align="aligncenter" width="605"] Rami and Dima Ceremony[/caption] There were custom chandeliers hanging inside on shepherds hooks all around the room and over the bars. The client's monogram was seen everywhere from the bars to the dance floor, menus and favors. The oval center truss was embellished with fresh flowers and the dance floor was white with silver monogram. The entertainment was nowhere short of breathtaking. Three Arab singers were flown in for the wedding and the icing on the cake was Ragheb Alama, who was flown in from Lebonon that night. The best part, was that it was a complete surprise to everyone. This singer is known in that part of the world as the Michael Jackson of the Middle East. Needless to say when he entered the room, the entire room was initially hushed in silence, followed by hundreds of smartphone cameras snapping pictures. He sang and enthralled the guests with his melodious voice for about an hour and at one point the couple and their respective families were on top of the stage dancing and singing with him. The night lasted till the wee hours of morning with midnight snacks after a five-course seated meal. A traditional Moroccan tea station was set with all the accompanying goodies and Exquisite Events did a fabulous job with their Exquisite Sweet Shop, their customized candy and dessert buffet. This event was truly a pleasure to plan and execute. We had such a nice time getting to know Rami and Dima and their families, and working with them to create a Royal Affair. We miss you Rami and Dima and are so excited to hear the news of Dima's pregnancy! Can't wait to plan a girly baby shower for the little princess!!! - Nikki and Madiha A special thanks to our vendors: Planner and Designer: Nikki Khan of Exquisite Events Florals: Tic Tock Chairs, mirror – Revelry Chair covers – Wildflower Linen Have an Exquisite day and we’ll see you next Wednesday! After the ceremony ended, guests were escorted through the hotel lobby to the foyer. The first sight was a round table dressed in custom gold linen with multiple beautiful bird cages with live doves drooping with flowers. The couple had expressed the desire to have a dove release after the ceremony but since ceremony was going to end at sunset and birds cannot be released due to fear of losing their way back, Nikki decided to bring the live birds and make them blend with decor. There were birds in cages spread throughout the cocktail area, some perched on pedestals, some on credenzas and some on the bars adding to the ambiance. Two plasma screens showed guests their seating assignment. A large mirror with the hand painted invite was placed strategically across from the entrance round table with the eye-catching birdcages. Because the clients were very specific about not using hotel furniture at all, all the furniture was removed. In the center of the foyer was a large square mirror bar with the couple's monogram. 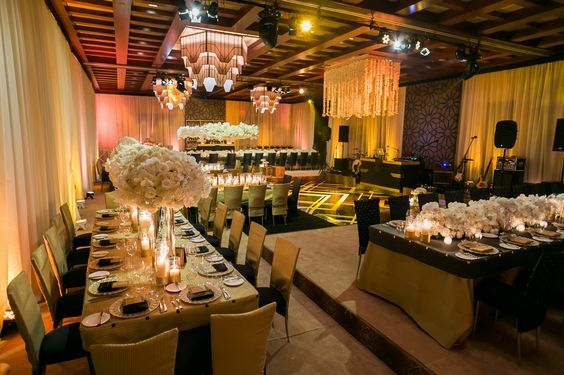 The entire pre-function space was decorated with furniture vignettes for one hundred guests. Our involved groom wanted the color palette to be black, red, and gold therefore Revelry provided furniture vignettes in the three aforementioned colors. Custom plexiglass cocktail tables with hanging chandeliers graced the space along with a few highboys in custom gold linens. There were 12 food stations including sushi, tapas, seafood, a Mediterranean station, Chinese stations, as well as tray passed hors devours. A stringed trio played beautiful music and guests were treated to a lovely ambiance with decor, lighting and music. The groom was also very adamant that as soon as the ballroom doors opened and after the couple's grand entrance, all the rented furniture was to be removed immediately. This was to eliminate seating and bar for guests' use outside the ballroom, to keep the party inside. The groom's theory proved to be true, as the guests happily remained inside the ballroom for the remainder of the evening. A special thanks to our vendors: Planner and Designer: Nikki Khan of Exquisite Events Florals: Tic Tock Furniture, mirror – Revelry Chair covers – Wildflower Linen Stay tuned for Part Three of this gorgeous wedding in our next blog. Have an Exquisite day and we’ll see you next Wednesday! Rami and Dima are of Jordanian descent. The groom, who was very involved in the entire process, wanted to hang the Jordanian flag alongside the California flag outside the Four Seasons hotel. For the authentic Catholic ceremony, we mixed different styles of chairs and we placed a special sign on a chair for the bride's late father. A huge mirror sat on the lawn with the couple's invite printed on it. 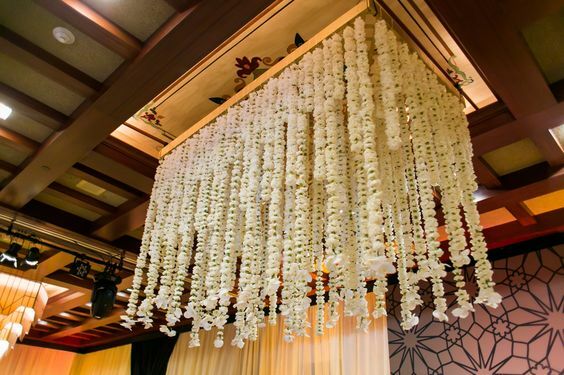 The flowers were in shades of champagne, cream and ivory to create a soft and romantic ambiance. Nikki designed the cocktail area and ballroom to be completely different in vibe and decor. After the ceremony, guests were led through Hamptons restaurant to the lawn. 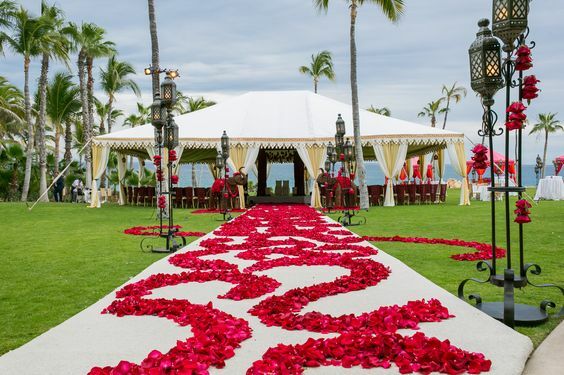 Nikki did not want them to feel like they were going out through a restaurant, so she decided to build a tunnel of ivory draping bearing beautiful crystal chandeliers and a carpet runner to give the feeling of "formal entrance." Upon guest entrance on the waterfall lawn, a live pianist was playing beautiful music and servers stood carrying drinks for guests. Madiha and staff did a seamless job with the processional and recessional. Needless to say we became very fond of the couple through the planning process and are continuing this friendship. Social Media – We Want to Hear From You! Dear Exquisite Events fans and followers, We want to hear from you! You may have noticed that over the past few months our Facebook, Twitter, Instagram, Pinterest, and blogs have been a little busier. That is because we have decided to put more time and love into our social media. This blog post is a letter to you, because we want to hear from you. We want the time that you spend looking at our Facebook page and our photos to be valuable and inspirational. We would love to offer our event planning wisdom and advice to newly engaged brides and grooms as well as to their friends and families. Please feel free to ask us questions, post pictures to our Facebook wall, and leave as many comments as you would like. We would even love to have you use our Pinterest as your very own inspiration board. If you are a current client of Exquisite Events, we will give you your own board on our Pinterest, so you can keep Nikki and Madiha in the loop on all your inspirations and we can also share pins with you. If you any comments, questions, or suggestions regarding Exquisite Events social media, please email exquiseventssocialmedia@gmail.com. We hope to hear from you soon! Have an Exquisite Wednesday and we will see you next week! Coordinator Trailor-HD 720p from VisualMasterpiece on Vimeo. To watch the video, type in the password: VM The wedding took place at Four Seasons Westlake and there were multiple events before the big day. The bride wanted color pallette of black, white and red. 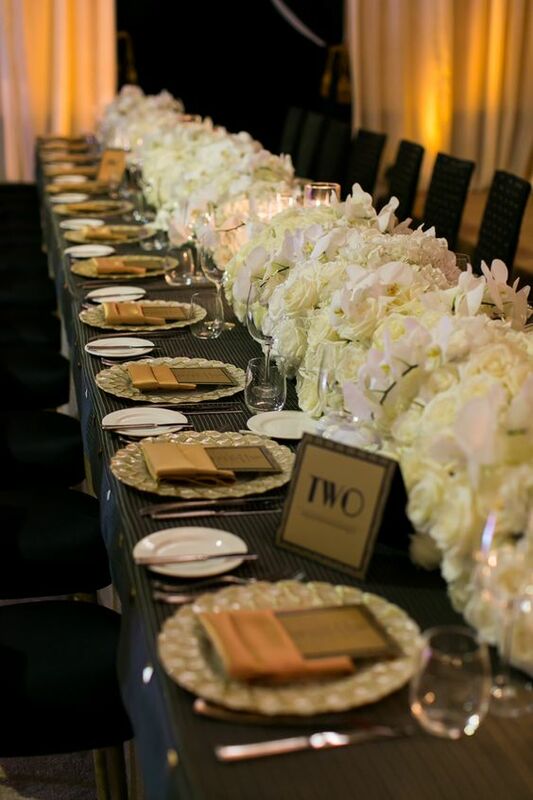 We transformed the ballroom by installing white carpet, draped the walls in white with tailored black valance and brought in different shapes of tables with custom white linens with black lace overlays. The long head table which seated 20 bridesmaids and groomsmen was very dramatic with a runner of candles and red flowers going down the center. Same lace that was used in the linens was incorporated into the cake. The couple wanted to sit on stage for the first half hour so the stage was furnished with large mirrors framed in black and a french sattee in white with two wing chairs. 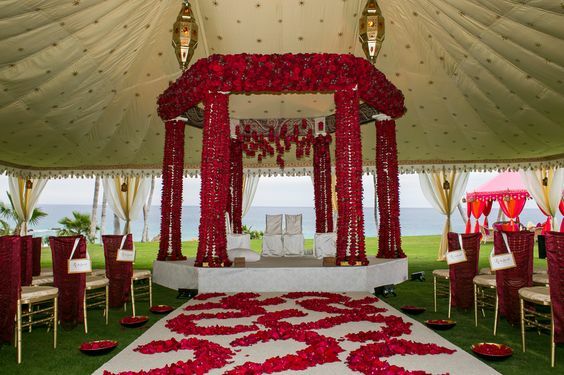 Amidst red flowers and the chandeliers that hung over the couple, the effect was magical. Couple made their grand entrance accompanied by professional ballroom dancers and went straight to the dance floor for their first dance. The father of the bride made an emotional speech and ballroom entertainment was provided to the guests during each dinner course. We were honored to be a part of this celebration and have endured lasting friendship with the family which to us is the best part of doing these events. Stay tuned for more pictures from this event on our facebook and instagram accounts and of course many more Exquisite Events! Have an Exquisite Wednesday, and we'll see you next week!